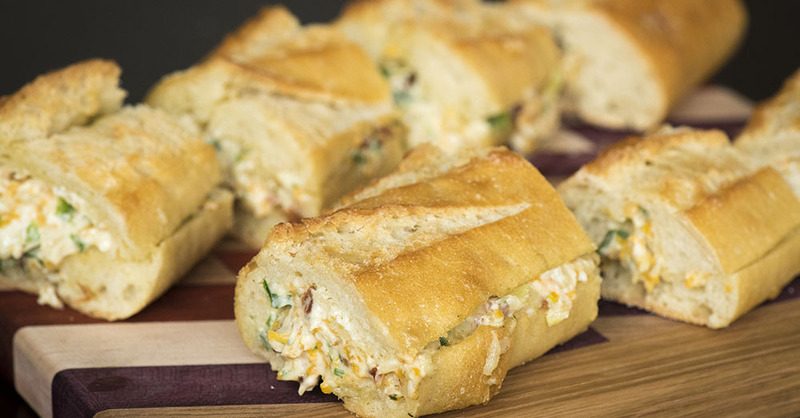 Take regular garlic bread to the next level with our loaded, cheesy baguette. While garlic bread is delicious on it’s own, it’s so much better stuffed with bacon and cheese! We used a combination of mozzarella, cheddar, and cream cheese for the perfect creamy and melty consistency. We also added green onions and jalapeño for extra flavor, but really, the filling possibilities are endless. This loaf is so hearty and satisfying, your family might just make a meal of it alone! Using a serrated knife, cut baguette almost in half lengthwise (butterfly cut), so you can open the baguette, but so that it’s still connected on one side. With a spoon or your hands, hollow out the baguette, leaving 1/2-inch of bread/crust. In a large bowl or mixer, beat together cream cheese, cheddar cheese, mozzarella, bacon crumbles, jalapeños (if using) and green onions until combined. In a separate, microwaveable bowl, combine butter, garlic and salt (to taste). Microwave for 20 seconds, or until melted. Stuff cream cheese bacon mixture into the bottom half of your hollowed out baguette, then brush garlic butter all along the top half. Close the baguette, so both halves are pressed together, and cut into 1/2-inch thick slices. While holding said slices together, transfer baguette to a large piece of aluminum foil and wrap up. Place loaf in oven (placed on baking sheet to avoid any spillage) and bake for 15-20 minutes, or until cheese is melted and gooey.